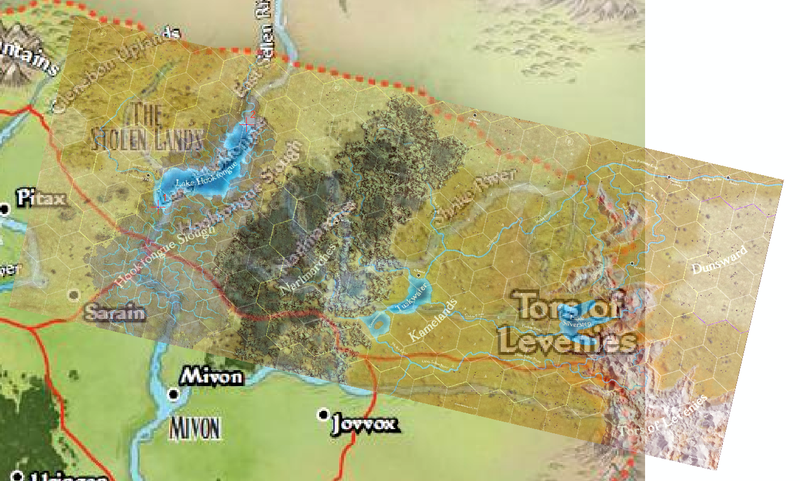 Lost Atlases: Getting down to the roots of why the Kingmaker map doesn't fit. Getting down to the roots of why the Kingmaker map doesn't fit. I was looking through my data today and I had a sudden fear that I'd made a terrible mistake with the orientation of the Kingmaker map and I would have to start from scratch. I ruminated over this during dinner and decided that whether I had to restart or not I would at least get to the bottom of where the inconsistencies lie in a way that was graphically obvious. So I took the maps I had and I started playing with them in illustrator - trying to fit one to another - and after several minutes realized that I wasn't making any progress. What i was doing was what everyone was doing: eyeballing it. What was needed was a statistical or unbiased approach. This got me thinking about that oh-so-expensive piece of GIS software - ArcGIS 10. Within its labyrinthine menus and windows was the ability to georeference one map to another. Georeferencing is the art (science?) of fitting one map to another by matching individual points on each map. Get a whole bunch of points on map A, match em' to map B and let the software stretch and manipulate the A to fit onto B. The more points, the better the fit. I started with two points - the top and bottom of Lake Hooktongue (Fig 1). With these, I was able to get a decent vertical fit. Lake Hooktongue is, i think, the most exactly drawn feature on each map, so it makes sense to start there. Having done that, its also apparent that problems begin. The Kingmaker map is very stretched out along the east-west (x) axis. 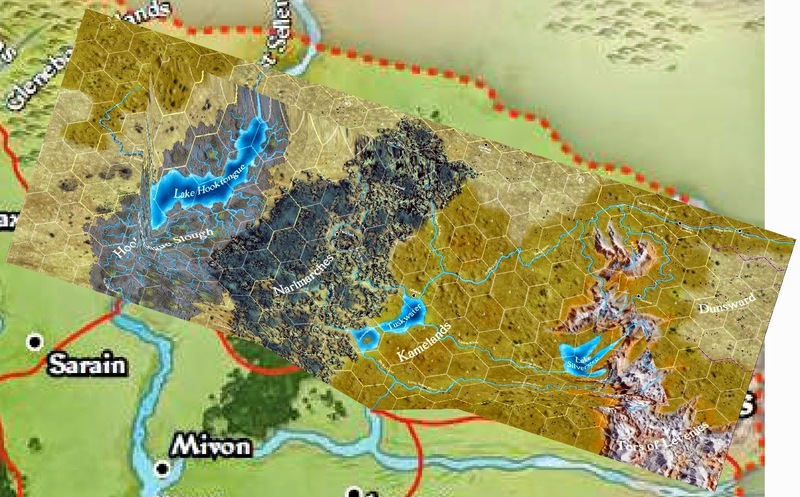 The map goes almost to the city of Pitax in the west and Lakes Candlemere and Tuskwater are far too east to correlate. Already, we can see that if we want to keep something as simple as hex integrity intact we have to sacrifice something. Figure 1: Georeferencing using two points (the top and bottom of the Hooktongue Slough). You should be able to click on it and it will enlarge in a pop up. Adding more points made matters worse (as expected). For Figure 2 I added three points in the east and two additional in the west for a total of 6 control points. 6 points is pretty good for control. A first pass on rectifying the two maps with these points gives us the best possible answer. Its equivalent to how well most people can eyeball the discrepancies. However, note that none of the green and red crosses match up. If the points really were georeferenced they would overlap and there would be no blue lines connecting them. All those blue lines are error and its not just error in one direction, its error in several. Figure 2: Georeferencing with multiple points but allowing for some error. Since I wanted to see exactly how bad this error was, I decided to force ArcGIS to try and resolve these errors. The result is Figure 3. It's pretty much what I envisioned. The Kingmaker map is folded and twisted to try to shoehorn everything into a predefined space. Getting to this point took several tries, by the way, and I had to add additional control points to keep the edges from getting out of hand. But in the end all the points had almost zero error. Figure 3: Resolving as much of the error as I could from Figure 2. My conclusion from all this is that the answer in the map I'm creating is an acceptable compromise between different features. It is one solution among many. As such, I'm content to go foward now with only minor revisions to the map. Postscript: I never used Rostov as a data point. When I examined its location on each map, I realized that it had been misplaced on one map (or the other). Going forward I will use the Kingmaker location because that is integral to the AP.